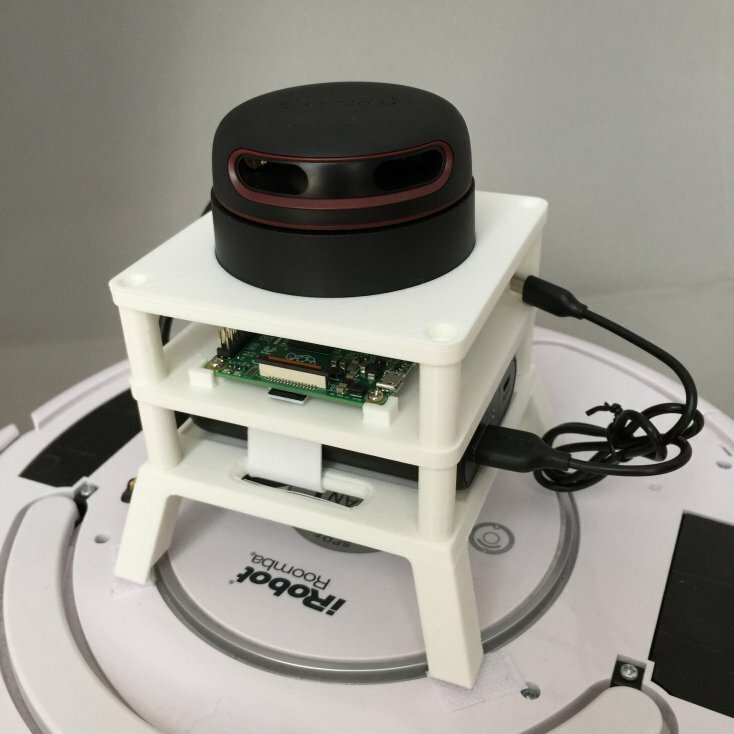 Roomblock is a robot platform consists of a Roomba, a Raspberry Pi 2 or 3, a RPLIDAR A2 and a mobile battery. It is good for the learning of the ROS navigation system. We use Roomba 535 and 780. Roomba 500, 600, 700 and 800 series is available to build the system. Caution, Roomba 900 series are not available because they have no serial port. You can use Raspberry Pi 2 Model B or Raspberry Pi 3. Pi3 has internal WiFi module while Pi2 does not. The software installation is slightly different, see Software section. You can use internal WiFi module with Pi3. You may need WiFi module for Pi2. We use this WiFi dongle. 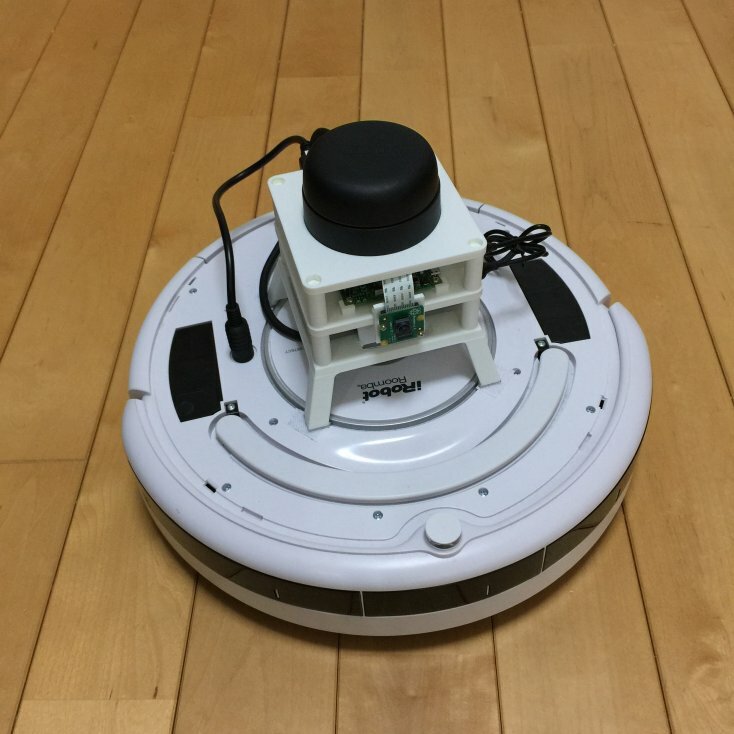 You need a USB-serial converter to make the Roomba and Raspberry Pi communicate. We notice this product is very handy to make the cable. Just cut the cable and solder to mini-DIN 9 pin connector. 3D printable data (STL) are available in Thingiverse. Download the Ubuntu image file for Raspberry Pi2 from https://wiki.ubuntu.com/ARM/RaspberryPi#Raspberry_Pi and dump to a micro SD card. Or you can use Etcher insted of dd, which has fancy GUI and easy to use. Same as Pi 2. Download the Ubuntu image file for Raspberry Pi 3 from https://wiki.ubuntu.com/ARM/RaspberryPi#Raspberry_Pi and dump to a micro SD card. The Ubuntu image for Pi3 is not official one, but it works anyway. You need to edit config.txt as mentioned in the section "Booting the official Pi 2 image on the Pi 3", or it doen't boot up after apt upgrade. Repeat, you need to edit config.txt as mentioned in the section "Booting the official Pi 2 image on the Pi 3", or it doen't boot up after apt upgrade. You should remove cloud-init package, because it may disable the network connection. In addition, we strongly recommend to make the firmware packages not being upgraded. If you upgrade the firmware, it can disable the internal WiFi module. Install script install_roomblock.sh may be helpful if you have same hardwares to us. The packages for roomblock are already released into Kinetic. So you don't need to build them by yourself. Use apt to install. If you have a Rasberry Pi camera module, you need to install libraspberrypi-dev. Somehow this package conflict with system package(libgles2-mesa-dev), you need to overwrite the package explicitly. $ sudo sh -c "echo 'start_x=1' >> /boot/firmware/config.txt"
$ sudo sh -c "echo 'gpu_mem=128' >> /boot/firmware/config.txt"
You can use 'ntpd' or 'chrony' to adjust the clock automatically. Please search by yourself how to do so.